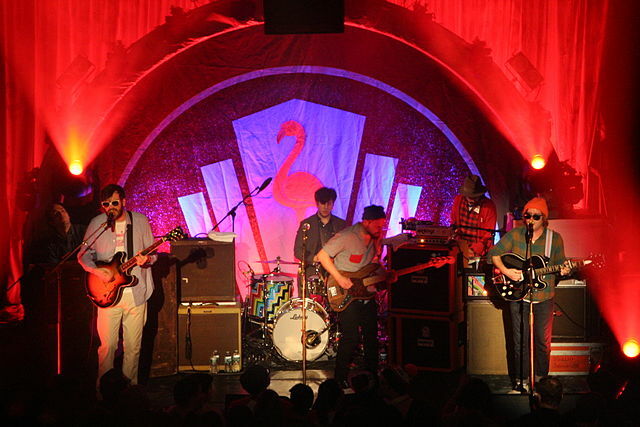 Dr. Dog in concert at New York City’s Bowery Ballroom. photo: MusikAnimal and Wikipedia. Any month in Pittsburgh that has a concert by The Who is a great month. Despite losing two key members over the years, the band continues to rock on. Carly Rae Jepsen also deserves to be in our Preview highlights, as she is the creator of one of the best-selling singles of all time—”Call Me Maybe.” Another artist in the same pop vein is Rachel Platten, who honed her skills working as a singer-songwriter in the clubs of New York’s Greenwich Village before hitting it big with her mega-hit “Fight Song.” Country music is one of the hottest genres going, so we’ve been getting some good twang here, even in the winter months. Gwen Stefani’s boyfriend and fellow judge on NBC’s “The Voice,” Blake Shelton, is in concert at the Consol Energy Center. The legendary Charlie Daniels will be providing some tasty Southern flavor with his country-rock hits. There’s also a couple of dogs this month—and I don’t mean bad, just that they have the word dog in their names—Three Dog Night and Dr. Dog. Now to address the “elephant in the room,” or more accurately, Spring Fling-2016 at the Petersen Events Center. The rock band Cage The Elephant headlines this event with several other bands also on the bill. Looking for some good local bands to celebrate St. Patrick’s Day? Then head out and enjoy one of the many talented Irish bands and performers we’re so fortunate to have in Pittsburgh, including: Red Hand Paddy, Guaranteed Irish, Corned Beef and Curry, Cahal Dunne, Donnie Irish, Whiskey Limerick, and Abbots Cross. Some places where you might find these musicians and can also enjoy a taste of Ireland’s native waters are Mullaney’s Harp & Fiddle, Riley’s Pour House, and The Claddagh. Whether you like Irish music or instead prefer German, metalcore, or emo, get out on the scene and enjoy some! Singer-songwriter-guitarist Jason Isbell is making a Pittsburgh stop at the Benedum Center in support of his latest release, 2015’s Something More Than Free. This is the sixth solo album by Isbell, who hails from Green Hill, Alabama. Something went on to win the Grammy for Best Americana Album earlier this month. A former member of Drive By Truckers, Isbell continues in the alt country tradition. Songs like “Cover Me Up” and “Goddamn Lonely Love” showcase his rich vocals and songwriting talents. Isbell is backed up by his band The 400 Unit. Shovels & Ropes opens. 7:30 p.m. 237 7th St, Downtown.